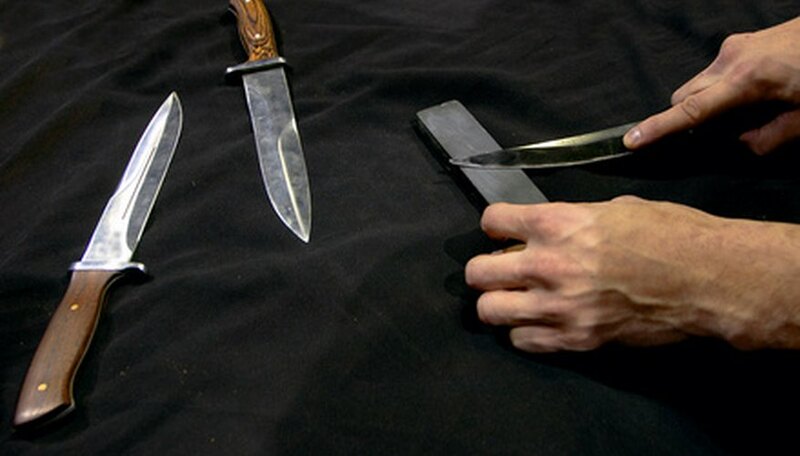 Properly sharpening a knife requires both patience and precision. It is a skill that must be developed with practice over a period of time. The action requires holding the knife at a specific angle as you slide the blade across a sharpening surface, honing the steel. Commercial sharpeners are generally considered the most efficient and easiest to use, but they are usually very expensive. As an alternative, you can develop knife sharpening skills with sharpening stones or honing rods, as they are much less expensive and perfectly sufficient when used properly. Make sure the honing rod is held stable in a vertical position by placing the tip of the rod atop a wood cutting board or a kitchen towel on top of a counter. These surfaces will prevent slippage during the honing process. Hold the handle of the rod with your weak hand. Using your strong hand, place the blade of your knife against the top of the honing rod, allowing it to rest against the steel at a 25-degree angle. Draw your blade gently down along the rod beginning with the blade placement near its base. Pull the blade back as you slide down the rod so that the entire blade--from the base of the knife all the way to the tip--slides against the rod. Maintain a 25-degree angle throughout each draw of the blade. Hone both sides of the blade across the rod until you have completed five to 10 draws to each side of the knife. Rinse and dry off the knife immediately after sharpening. If the blade is a carbon steel and not stainless steel, oil the blade--magnolia or clove oil are generally considered the best, but any vegetable oil will do--to prevent rust. Select sharpening stones of varying grades. As you sharpen your blade, you will advance, in succession, to stones of finer grit. Place your sharpening stone on top of a surface that will prevent it from slipping while you are sharpening the blade. Make sure your stone is large enough to sufficiently sharpen the blade. Hold the knife handle in one hand. With your other hand, apply pressure to the back of the blade as you slide it across the sharpening stone. Remember to draw the entire knife across the stone, from the base to the point, all in one draw. Do not simply sharpen one specific section and then attempt to sharpen another. The passes should be even along the entire length of the blade. Maintain a 25-degree angle as you draw the knife over the sharpening stone. For a precision sharpening job, attach a guide to your blade that will control the angle, allowing you to rely on the equipment’s precision rather than the steadiness of your hand. Advance to finer and finer sharpening stones. Rinse and dry your blades after you have achieved the desired sharpness. Oil any carbon steel blades with magnolia, clove or vegetable oil to prevent rust.